Special Report It was Open London last weekend, where for two days we got to see inside buildings normally closed to the public. With Doctor Who’s Tardis being unavailable, my kids found themselves on the Dazzle Ship moored in the Thames*. They were at once accosted by someone showing them an app. Take a photo, slap it on your own Dazzle Ship, turn it into a 3D model and share it with others! Available on iPhone, iPad and Android! Two steps in, and they hadn’t yet seen a thing. The app isn’t terrible, but given that the kids have been taking pictures using a phone or tablet and jazzing them up in funky filters since they were two, it didn’t give them anything new, either. They’re still at the age where they’re amazed by everything, and Dazzle Ships were such an odd idea it was hard to see how something interesting couldn’t be conveyed. Like: What was the idea behind it? How was this anti-camouflage supposed to work? Were they effective? You know what kids are like – questions, questions, questions. But the app had no answers. That wasn’t the app designer’s brief. It never is: distraction is the point. My experience is pretty common today. You can’t walk far into a museum or gallery without being showered in digital gimmicks. In this case, we got about a yard. Is there too much of this now? Is it even a good thing at all? Does the digital gimmickry distract you from the real experience? 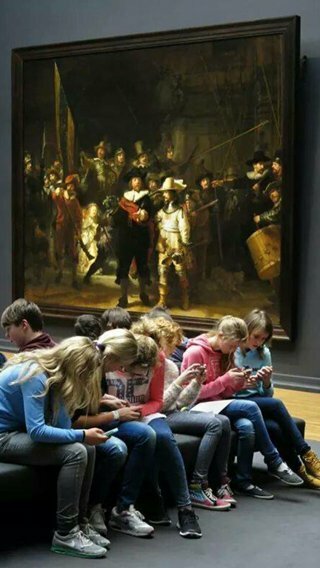 One popular picture circulating last year seemed to sum up such anxieties – the “kids ignoring Rembrandt” photo, showing teens tapping away at smartphones oblivious to Rembrandt’s painting The Night Watch. This led to much hand-wringing, since there are some things you need to experience first-hand, not via a crappy digital thumbnail, and great paintings by old dead white guys are one of them. Unfair**, cried others: “Hey, analog Dads – leave the kids alone!” And the pic spawned this joke, which may not actually be a joke at all, but next year’s “digital engagement and inclusion strategy” at the Rijksmuseum. Either way, it is hard to argue that today we have a shortage of digital gimmickry or even a shortage of digital art, with the taxpayer-funded institutions of the culture sector tipping millions into the cause of digital distraction. Nobody holding a purse of your money seems to be able to say "no" to an idea containing the word "digital", which has become a magic key to release funding which might otherwise be denied, if the idea was considered on its merits. In fact, digital art is now so ubiquitous, defining it is as difficult as defining a digital startup or a digital business. For example, to big up its “digital cluster”, the government began to count chemists, public relations companies and even the Bank of England as digital businesses. Because almost all use modern communication tools or technology, they all must be digital. Yesterday, the Daily Mail stumbled upon the phenomenon, without really realising it. In its quest to find skeletons in Alan Yentob’s enormous wardrobe, the paper discovered that the BBC created a digital arts quango, then chucked money at it. The BBC incubated the nebulous concept, chipping in half of the £16m funding for the new quango – and gave it the real committee-couldn’t-think-of-a-name name, "The Space". There are also ideas which aren’t actually so bad, but which should really belong to existing BBC shows or services, such as the “John Peel record collection”. In reality, this is a playlist “curated” by an artist. It’s really somebody doing a guest spot on Radio 6 Music, only with a picture of the sleeve or disc. In the two years since launch, Space has managed to produce just four of these John Peel playlists, leaving us to wonder, why it couldn’t be done without the committees of digital arts bods hemming and hawing? If this proves anything, it’s that “radio people” are hardworking and inventive (because they need to be) while digital people take a long time to do anything at all (because they can). Even posing the question of why John Peel record collection playlists are on Space, not 6 Music, is an interesting question to pursue, because it gets to the point (or lack of it) of funding a new digital arts quango. Alan Yentob’s closet may contain a city-sized cemetery for all we know, but the BBC’s creative director is surely a red herring in this story. A better question is why Space exists at all. And we can only answer that by examining how it came about.